Hull City ended a five-game winless run and moved to within seven points of Championship leaders Burnley with a routine win over Bristol City. Curtis Davies turned in the opener from a corner and Robert Snodgrass made it 2-0 by heading home a Sone Aluko cross. Mohamed Diame's long-range effort into the bottom corner and Aluko's strike sealed the win against the relegation-threatened Robins after the break. Hull remain fourth, but are just three points behind third-placed Brighton. The Tigers also have a game in hand on Burnley and Albion - who earlier drew a thrilling match against the Clarets at the Amex Stadium. Bristol City, who remain six points clear of the relegation zone following Fulham's win over Milton Keynes, created several chances, but never looked like earning a fifth win in six away games. Tigers keeper Allan McGregor made a couple of decent saves, Jonathan Kodjia had an effort ruled out for offside and substitute Luke Freeman hit the post late on. But Hull, who have let in just six goals in 2016, the lowest tally of any Championship club, eased to victory. "Look there's been nothing really wrong with the performances. "We've had more attempts, more shots, more crosses, more final-third entries than any other club in the division. "However, the one statistic which is the stand out one is that we haven't been able to score for whatever reason and that's been frustrating. "Once we scored then there was a calmness about us which was good to see." "I thought we were still in the game at 1-0, we looked slick on the break but inevitably we didn't get too many breaks in the game and unfortunately their quality was too much for us. "The Championship is relentless and the games keep coming thick and fast so we just have to pick the boys up because we have a massive game on Tuesday and it almost becomes a cup final for us. "Rotherham are in good form and (we were in) good form before today, it's two outstanding runs. It almost becomes one of those mini six-pointers. Match ends, Hull City 4, Bristol City 0. Second Half ends, Hull City 4, Bristol City 0. Attempt blocked. Abel Hernández (Hull City) left footed shot from the left side of the box is blocked. Assisted by Sam Clucas. Foul by Jonathan Kodjia (Bristol City). Offside, Bristol City. Marlon Pack tries a through ball, but Aaron Wilbraham is caught offside. Luke Freeman (Bristol City) hits the right post with a left footed shot from the centre of the box. Attempt blocked. Jonathan Kodjia (Bristol City) right footed shot from the centre of the box is blocked. Attempt blocked. Aaron Wilbraham (Bristol City) right footed shot from the centre of the box is blocked. Assisted by Luke Freeman with a cross. Attempt missed. Luke Freeman (Bristol City) left footed shot from the centre of the box misses to the left. Attempt missed. Tom Huddlestone (Hull City) right footed shot from outside the box is high and wide to the right. Assisted by Andrew Robertson. Substitution, Hull City. Abel Hernández replaces Sone Aluko. Goal! Hull City 4, Bristol City 0. Sone Aluko (Hull City) left footed shot from the centre of the box to the bottom right corner. Assisted by Ahmed Elmohamady. Attempt missed. Ahmed Elmohamady (Hull City) header from the centre of the box misses to the right. Assisted by Sam Clucas with a cross following a corner. Substitution, Hull City. Shaun Maloney replaces Mohamed Diamé. Corner, Hull City. Conceded by Aden Flint. Attempt blocked. Mohamed Diamé (Hull City) left footed shot from outside the box is blocked. Assisted by Andrew Robertson. Attempt blocked. Joe Bryan (Bristol City) left footed shot from outside the box is blocked. Substitution, Hull City. Ahmed Elmohamady replaces Robert Snodgrass. Attempt saved. Joe Bryan (Bristol City) right footed shot from the right side of the box is saved in the bottom left corner. Assisted by Jonathan Kodjia. Corner, Bristol City. Conceded by Moses Odubajo. Attempt blocked. Lee Tomlin (Bristol City) right footed shot from the centre of the box is blocked. Substitution, Bristol City. Aaron Wilbraham replaces Bobby Reid. Goal! Hull City 3, Bristol City 0. Mohamed Diamé (Hull City) left footed shot from outside the box to the bottom right corner. Assisted by Sam Clucas. Foul by Moses Odubajo (Hull City). Lee Tomlin (Bristol City) wins a free kick in the defensive half. Attempt blocked. Aden Flint (Bristol City) header from the centre of the box is blocked. Assisted by Jonathan Kodjia. 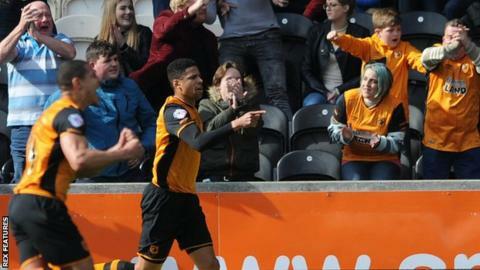 Delay in match Curtis Davies (Hull City) because of an injury. Substitution, Bristol City. Luke Freeman replaces Peter Odemwingie. Corner, Hull City. Conceded by Alex Pearce. Moses Odubajo (Hull City) wins a free kick on the right wing. Foul by Peter Odemwingie (Bristol City). Mohamed Diamé (Hull City) wins a free kick in the defensive half. Foul by Lee Tomlin (Bristol City). Offside, Hull City. Tom Huddlestone tries a through ball, but Robert Snodgrass is caught offside. Corner, Hull City. Conceded by Adam Matthews. Attempt missed. Sone Aluko (Hull City) left footed shot from outside the box is too high. Assisted by Robert Snodgrass. Attempt missed. Sam Clucas (Hull City) left footed shot from the left side of the box misses to the right. Assisted by Mohamed Diamé. Offside, Bristol City. Lee Tomlin tries a through ball, but Jonathan Kodjia is caught offside.